"The goal was to create an atmosphere of extravagant luxury," explains costume designer Dede Ayite. "We wanted to showcase the ostentation of the 18th-century French court, to enter into its world of opulence and invite the audience to experience the flamboyance that was Marie Antoinette as she journeys to her tragic demise." In the first scene, we see Marie and her two besties having afternoon tea, dressed in foamy skirts matched with rhinestone t-shirts and Malibu sunglasses. "It was important to incorporate period silhouettes in order to ground us in the story. After talking with [director] Robert O'Hara about how Marie's look has to set the tone for the entire show, I drew inspiration from today's pop-culture vocabulary, and also from some of the remarkably creative African-American Hair Design shows we've seen recently." This brings us to the wigs! Not since The Lion King have actors had to support so much extra weight on their heads, necks and shoulders. "Every wig is 100 percent hand-made," says designer Dave Bova, "The caps are made of a product from Sweden called 'wig lace' and are constructed on molds made from each individual actor's head. We then attach one hair at a time with a sewing needle-sized hook. The finished wigs are pinned through the cap to the wearer's own hair." At one point, Marie has to have some of her locks scissored off onstage. How is that achieved? "For every performance, we pin some clumps of loose hair into Marie's Act Two wig, and Tim Frank—who's really good at miming actual cutting—just slides those sections out." Bova recalls a whole day's rehearsal set aside to allow actors to acclimate to the physical disequilibrium precipitated by top-heavy body mass. Less preparation was needed for them to navigate the ice rink-slick floors and clear plastic furniture, Clint Ramos assures me. Not only did the actors begin working with their 'show shoes' early on, but the transparent chairs have "a surprising amount of visual volume." What was the concept behind the glass-house decor? "We looked at a lot of Chanel and Lagerfeld runway shows, where my attention was caught by a mirror in a dressing room that was beveled and faceted like a jewel, so that it reflected everything around it. [Adjmi's] play is very much about how someone perceives their image, or how others perceive them—so mirrors seemed the appropriate metaphor." How do these elements hold up under the wear and tear of eight shows a week? Ramos confesses that the shiny surfaces tend to scratch easily, while Bova laments the weather's effects on the elaborate coiffures ("Since [the wigs] are made of human hair, they get frizzy on humid days, staticky in dry indoor-winter air, limp on two-show days—just like our own hair.") This necessitates daily repairs, but "Fortunately, we have this stylist named Brandy Karlsen, who's willing to put in nearly sixteen hours a week re-styling every single wig. She's amazing!" 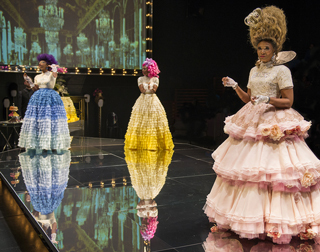 Marie Antoinette runs at Steppenwolf Theatre through May 10.